It’s simple really. All I have to do is put one word in front of another, types of words ordered in a particular way. As I often do when I am having difficulty writing, I begin gazing around my bookshelf and my eyes stop at Stephen Dobyns’s book, Best Words, Best Order. That’s it, I think, all I have to do is find the best words and put them in the best order. I have the opportunity to tell the story of grace and redemption every single week. I cannot think of a greater privilege than this. But today it does not feel like a privilege. The best words cannot be found and the best order cannot be mapped. It is the Saturday Demon. The Saturday Demon comes around on Saturday when I am trying to put the finishing touches on my sermon for Sunday. I have spent all week studying, reading, praying, researching, translating, and beginning to write, but Saturday is my finishing day. For me, the real danger that the Saturday Demon poses is not that it creates doubt, it is that it highlight and fortifies the doubts which are already so present. The Saturday Demon knows exactly how to attack. I begin to wonder if this is worth it. Perhaps it doesn’t matter, perhaps I am doing this all for nothing, perhaps none of this is real. Confession time: I am a pastor, and I have great doubt. 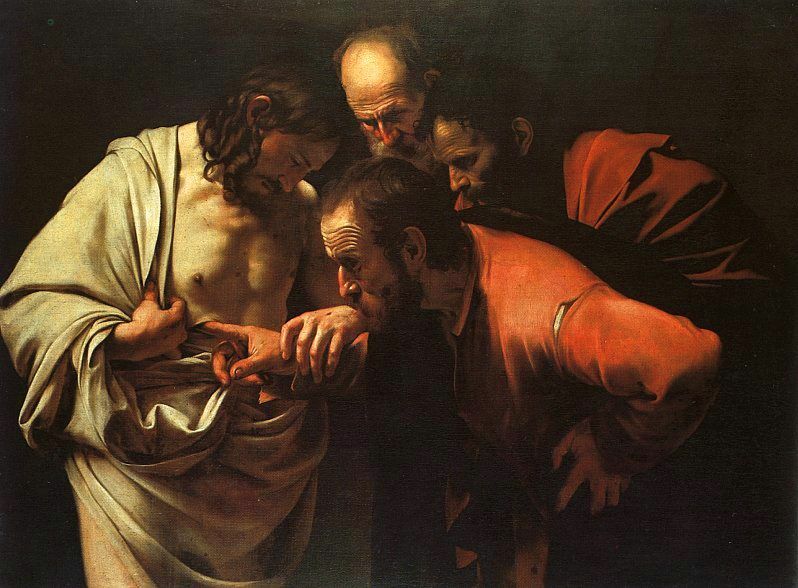 I’m a doubting Thomas, as some might call me, although I loathe this term. Why does Thomas get such a bad rap? Peter denied that he knew anything about Jesus of Nazareth not once, not twice, but three times. Do we remember Peter only as a denier? Do we call someone a “I Don’t Know Him Peter”? No. But Thomas’s reputation is forever stained as being a doubter, and doubting is seen as something terrible. Doubt is the antithesis of faith, we tell our young people, doubting is weakness. Doubting is sin, we say, God wants us to have confidence. The more I try to ignore the Saturday Demon, the louder is speaks. Rather than trying to ignore it, I decide to listen to it for a moment. Hear it out. After all, Jesus didn’t just try to ignore the devil when he was being tempted in the desert, he carried on a conversation. “Are you finished?” I ask the Saturday Demon. “I’m going to get back to work now,” and I continue pounding away on the keyboard trying to find the best words and trying to find the best order. The Saturday Demon continues to assault me, but it is important that I do not give in to its attack, I cannot become defeated, and the best way to do this is to keep working, even when these doubts erupt on schedule like Old Faithful. After all, I have people who depend on me. I’m a pastor. I’m a doubter. Maybe this is why God has called me to this kind of ministry at this point in my life, so that even when I have great doubts, I still have to show up, stand in front of the congregation, and tell them the good news of the story of grace and redemption. It is through telling of the same story over and over again that I can, in some way, continue to believe even with my doubts. Perhaps the reason that we will always link doubt and Thomas together, perhaps the reason that we remember Thomas for nothing other than his doubts is that we see ourselves in Thomas. In seeing in this mirror, we can see in ourselves what we so greatly despise, and we attempt to ensure that we keep him and his doubts at arm’s length. This disapproving way that we speak of doubt is incredibly unfortunate. Truly, if doubt has no place in the church, it is no wonder why so many young people leave the church. If doubt has no place in the journey of faith, it is no wonder why there are an increasing number of “nones” when asked about religion. Perhaps it is not the absence of doubt which is to be prized, but the ability to have faith and doubt at the same time, and live with the tension. This entry was posted in Ministry and tagged Doubt, Preaching, spirituality, Worship, Writing on February 1, 2013 by Matthew van Maastricht. I had the privilege of administering my first baptism yesterday. It was an infant who was recently born of one of the families in our congregation. It was a wonderful celebration of the sacrament of baptism. The liturgy is beautiful, the child was adorable and dressed in this lovely white dress. She fussed a little bit but it was not like the weeping and gnashing of teeth that sometimes occurs. As a fellow pastor friend of mine once told me, “If the baby doesn’t cry you’re not doing it right.” Which refers, of course, to the fact that in baptism we symbolically die with Christ, and as such, there should be at least a little bit of fussing. though you know nothing of it as yet. We love because God first loved us. That is, of course, quote from 1 John 4:19. This is also where the theology behind infant baptism all comes together. I cannot find a better defense of infant baptism than this. After these words were spoken, and I dipped my hand into the water, I felt as though we were all in the very presence of God. I wish that we could have stayed in that holy moment forever. However, that moment did not last. Shortly after the service, the sinfulness that pollutes the world reared its ugly head. Divisions, anger, self-centeredness and greed invaded the aftermath of this holy moment. It had been a very difficult couple days leading up to that day, and I felt as though I was delivered from the inferno to the very presence of God and then immediately dragged back to the inferno. I quipped to my wife after we returned home that this experience is what Dante saw in his vision when writing the Inferno. Perhaps, however, this was somehow a gift, it is an example of life in this world. Our world is grossly imperfect, polluted by sin and evil. Much of life is filled with trials and sufferings, but these are always punctuated by moments of heaven. We baptize infants not because they are perfect, not because they are faithful Christians, not even because they are good. We baptize infants because God first loved us, and therefore we are able to love God because God loves us first, and we are able to love others because God loves us first. Perhaps it is fitting to experience both the heights of the experience of God’s grace and the depths of depravity. This is, after all, what we experience in this life. We have experiences when love is easy, when we feel loved. We also have experiences in which love is difficult, and we have to love in spite of the fact that all we may receive is hate, anger, and bitterness. We do not love because the other is nice, or because they are even deserving of our love. We love because God loved us first — God loved us despite of our anger and bitterness and hate, and God requires that we treat others in the same way. I wonder what that child thought of all that was going on. I do know that she rubbed her forehead onto my shirt to dry it during the prayer after the baptism. I’m sure she had no idea what was happening, and I am certain that she has no idea what the future holds for her. I do know, however, that God’s grace is not ultimately dependent on what we can understand with our minds, but God’s grace is stronger than all of our weaknesses. My ability to love people is often times weak, and I continue to hope and pray that God’s grace will not only transform the life of that child as she grows, but also transform my life as I am still in the process of becoming a Christian and learning how to truly love. This entry was posted in Church, Ministry and tagged Brokenness, Church, Despair, Patience, Urban Ministry, Worship on August 27, 2012 by Matthew van Maastricht. I had a conversation with someone the other day on the sidewalk in front of church. I was picking up some trash that always blows into our bushes from the park across the street. A person stopped and asked me some questions about our church, which I answered. I told him about our Saturday morning breakfast ministry, and I also invited him to join us for a service on a Sunday morning. He mentioned that he’ll probably show up on a Saturday morning rather than a Sunday morning, for now, because he didn’t want to have to pretend. He took his leave and we exchanged pleasantries. His comment about not wanting to pretend stayed with me for quite some time. As is usually the case, after time of reflection, I came up with some good responses. You don’t have to pretend, I thought, everyone is welcome. You are welcome to come as you are, I thought. You are welcome to journey along with us, regardless of where you are on your journey. Of course, he was gone, and like many people I meet, I will likely not see him again to share these insights. So at this point, the best that I can do is learn from it. What was even more important than how I would have responded to this fellow is why he would felt as if he would have to pretend. Perhaps he was referring to the more ecstatic utterances that some traditions emphasize. Perhaps he was referring to singing songs and hymns of praise if he didn’t believe what he was singing. The truth is, however, that I will never know what he meant, and what prompted him to say that. However, what I am able to do is to reflect on what our church says not only to those who are members or adherents of our congregation, but also those who come in off the street. Now first of all, our church is quite unique. We are a church properly organized according to our denomination’s government. However, in actuality, we function more as a mission. We are placed in a community that has a lot of churches, but also a community where a high percentage of the population is not regularly involved in a church. Therefore, our goal is first and foremost not teaching doctrine, but to introduce people to God in word and in deed. I come from a subculture where the hot topics were debating the benefits and drawbacks of the Canons of the Synod of Dort and whether or not Article 36 of the Belgic Confession is based on sound biblical exegesis. In my current context, however, those doctrinal discussions have turned into basic, “who is Jesus and why does he matter?” discussions. Most of the people in my community don’t care about doctrine, they care about how God impacts their daily life. This is not to put them down, it is simply a reality. I have come to understand that debating and discussing the finer points of doctrine is an activity in which the privileged are able to engage. I have found that the mindset in which I prepare sermons must change. I can no longer prepare my sermons with the assumption of faith, but I must always prepare my sermons with the intent of inviting people to faith. There are some that argue that “reaching the lost” is not the purpose of Sunday morning, however, I disagree. Even those of us who identify as Christian, or who identify as disciples of Jesus are still lost, in one way or another. I believe that faith is a gift from God, but I do not think that faith and doubt are necessarily opposed to one another. There are many days where I’m not even sure if I have faith! After all, I think that in some way, we are all crying, “I believe; help my unbelief!” (Mark 9:24). Even for those of us who have faith, it is only natural for us to have times of doubt. Sunday services are then, not simply a time of expressing faith, but also a time for creating and renewing faith. The church, then, should be the best place for us doubters. Those who have iron faith should be hermit monks in the desert to whom others can visit on pilgrimage. The church is the place where we can go when we have seeds of faith, and the church is the place we can go when we are sure that we don’t have any faith. Our church is certainly not “seeker-sensitive.” However, I don’t think that our church operates on the presumption of faith either. The best thing that our church can be is “doubter-sensitive.” A place where no one has to pretend, but where folks want to have faith, regardless of whether or not they feel like they do at the time. After all, faith is a journey not a destination. In all of our hearts, there is a voice, “I believe; help my unbelief!” I love it when people passionately express some variant of this. When it comes down to it, I am no different; I am just another pilgrim on the journey to restoration and redemption. This entry was posted in Church, Ministry and tagged Faith struggles, Preaching, Urban Ministry, Worship on April 30, 2012 by Matthew van Maastricht. Ever since I became a pastor I have put a lot of thought into the first words of the worship service at our church, and I have also begun paying attention to the first words of church services that I attend. There are, to be sure, many important words in a worship service, but the first words are arguably the most important. The first words set the stage for all that is to come, the first words are the conduit through which the community enters the worship experience. Just as first impressions are so very important, the first words in the worship service are very important. One way that is often done, and was done here at my arrival was to start the worship with, “Good morning. Welcome to ____________”. This is, of course, a fine way to start. Welcoming people and greeting people is certainly a good thing to do. However, I’m not sure if this is the best way to begin a worship service. You can place anything in that blank, be it a church, a school, a football game and it would be appropriate. While there is nothing wrong with these words being the first words in the worship service, I don’t think that they are sufficient for what we are doing. Another popular way to begin a worship service, and one that I thought about is, “This is the day that the LORD has made, let us rejoice and be glad in it.” This is very clearly a theological statement, as our joy and gladness is rooted in the fact that God made this day, rather than the fact that the sun is shining or it is not snowing or whatever. However, my concern with this declaration is that our church may be confused with prosperity type Christians. Those who think that you have to be happy all the time, those who think that if you’re faithful God will cause you to prosper and not have troubles and hardships. Many people aren’t happy when they go to church for many reasons. Some may have just had a big fight with their partner, others may have pulled their hair out trying to get their children ready, others are wondering how their empty cupboards will get filled, others slept on the floor last night because they do not have a mattress or bed, still others may be mourning the death of a loved one. The last thing that I want to do is to ask people to put on a fake smile, and I certainly do not want to make those who are not happy feel as though there is no place for their mourning or pain. The votum is peculiar because it is neither a greeting, nor a prayer, nor a call to worship. The votum is a declaration of faith which comes from Psalm 124:8. This is something that is thoroughly theological, and appropriately sets the stage for Christian worship. This is something that we can all enter into regardless of what is going on in our lives. For those who are suffering, it declares that God is our help, and it calls to mind the promises of God that God will never abandon us in the midst of our dark places. For those who have been delivered from suffering, it provides a reminder that our deliverance, or our help, comes from God. This is fitting for the first words of worship because it reminds us who God is, and what God is about. God visits us in our distress, and provides aid. The God who gives us aid is the same God who created everything. This is why we can trust that God will visit us and provide assistance to us when we are in distress, because the God who created all is still involved in the world, and is still working out God’s purposes. “Our help is in the name of the Lord, who made heaven and earth.” This is what I want people to remember, and this is how I invite people into worship. These are words that I take with me everywhere I go, and my hope is that my parishioners would do the same. These are words which form us into a community. The words are not, “my help” but “our help”. God is not just my help, but everyone’s help. The only help that we have in times of distress is God, and this is what we all share together. I trust that these words have a power and a life of their own, and I trust that God makes these words effectual. In worship I don’t explain the votum, I allow it to speak for itself. I don’t tell people what to do with it, I allow it to work on them. These are some of the reasons that the first words of our worship service are “Our help is in the name of the Lord, maker of heaven and earth.” This is before a greeting, a welcome, or the call to worship. The way our service begins every week is with this short declarative phrase which invites people to worship the God who created heaven and earth, and to worship the God who helps us in our distress. It reminds people why we gather, and it reminds people that God is in our midst. This is a statement that is the result of faith, and it is a statement that creates faith. Worship, after all, is not just an expression of faith, but it is to create faith as well. 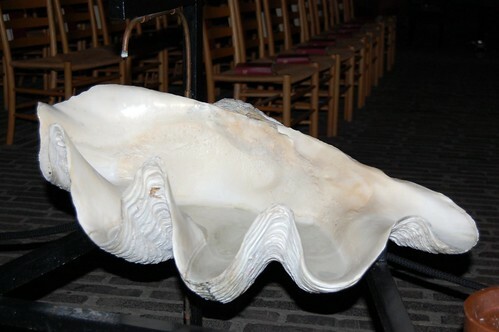 This entry was posted in Church and tagged Language, Worship on April 19, 2012 by Matthew van Maastricht.